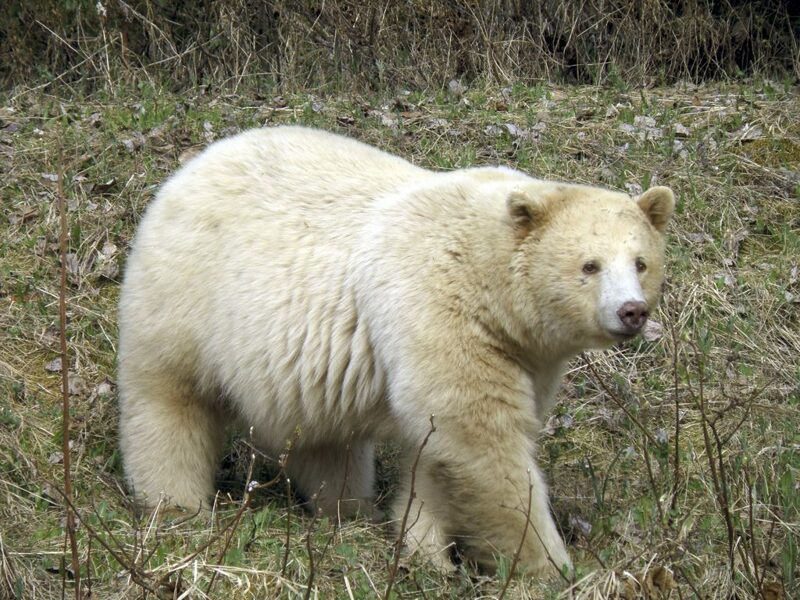 Kermode Bear Photo Taken By Mandi. 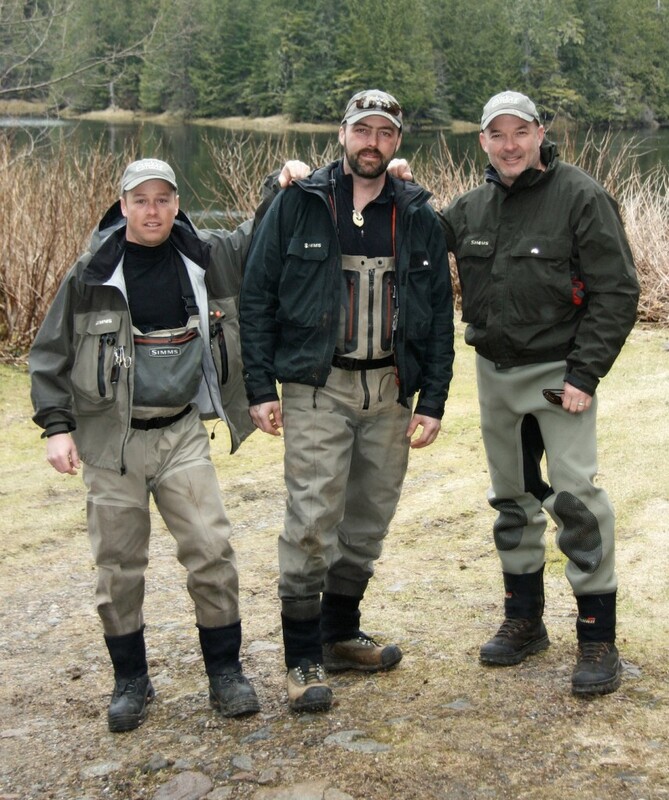 Kitlope King Salmon Fishing – Eco Adventures. Come and join us on an adventure in an un-spoiled un inhabited BC Park one of British Columbia’s Largest Rain forest Eco Preserves. At Westcoast fishing adventures we strive to exceed your expectations. We have all the right equipment to get you there safely we are licensed and insured with 23 years of working knowledge of these water sheds. Terrace BC fishing guide for Steelhead & Salmon Westcoast Fishing Adventures 20 years of hooking up ! Report for Jan 14 2016 – The weather has started to break with temps just above the freezing level this will slowly see the ice off the rivers. 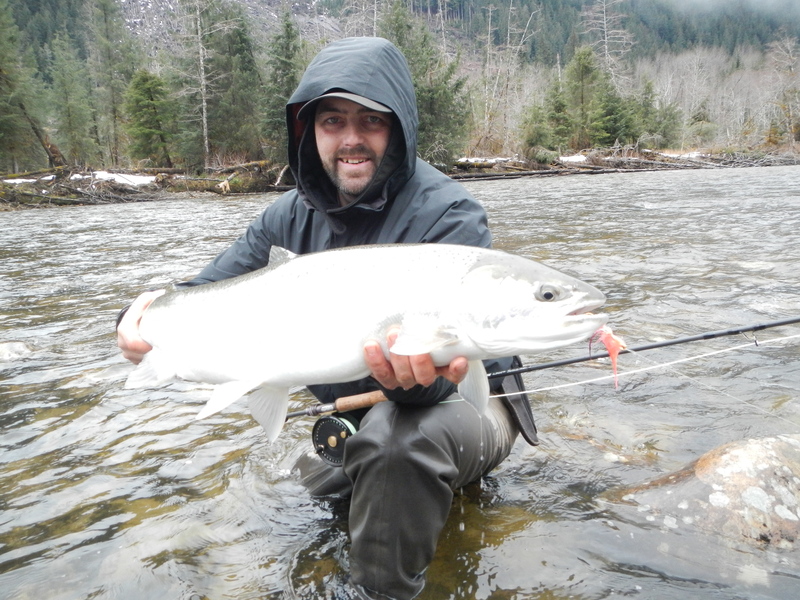 The Kalum river is closed Nov 15 to guiding until April 15 at which point most of the summer and winter steelhead will be spawning, I recommend leaving these fish un-harassed to lay their eggs for future generations. 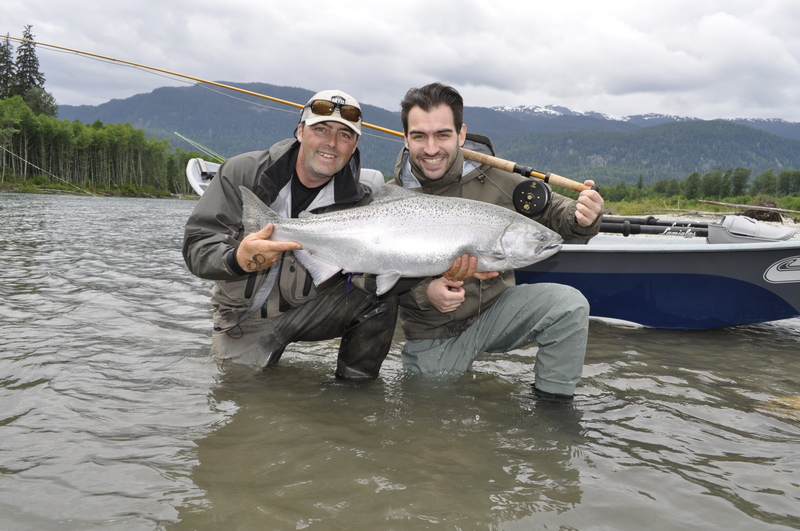 however the main stem Skeena will have great fishing for some monster steelhead as well as the spring chinook. 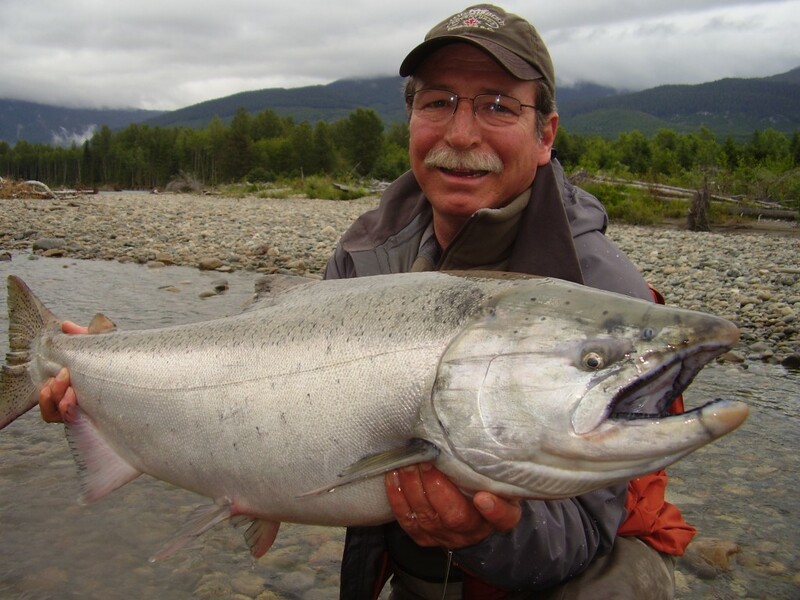 March,April,May the Kitimat river is fishing well Large Steelhead start there migration into the Kitimat river in March & the Runs build from there on. 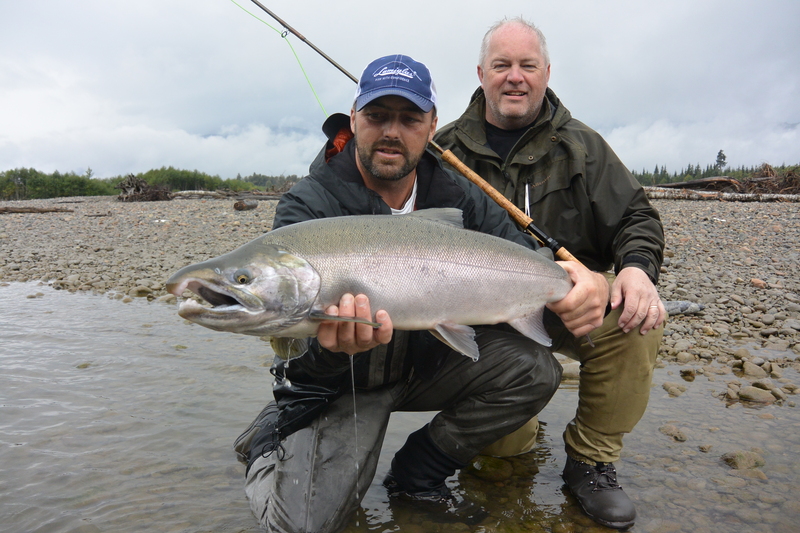 April,May – You can expect to hook Steelhead & Chinook on the same day. Chinook Salmon Taken on the Fly Kitimat River BC. We are looking forward to seeing the end of winter its been a cold one, Tying flies and preparing for fishing shows has been passing the time quickly. 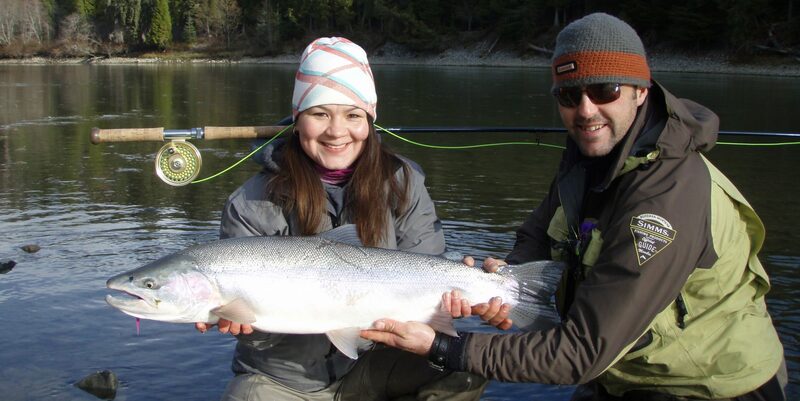 The Lakelse river is another options being lake fed offers some fantastic Steelhead fishing through February and March be sure to check the regulations on open and closed areas as well as bait restrictions, Fly Float,Spin – eggs no eggs Etc. 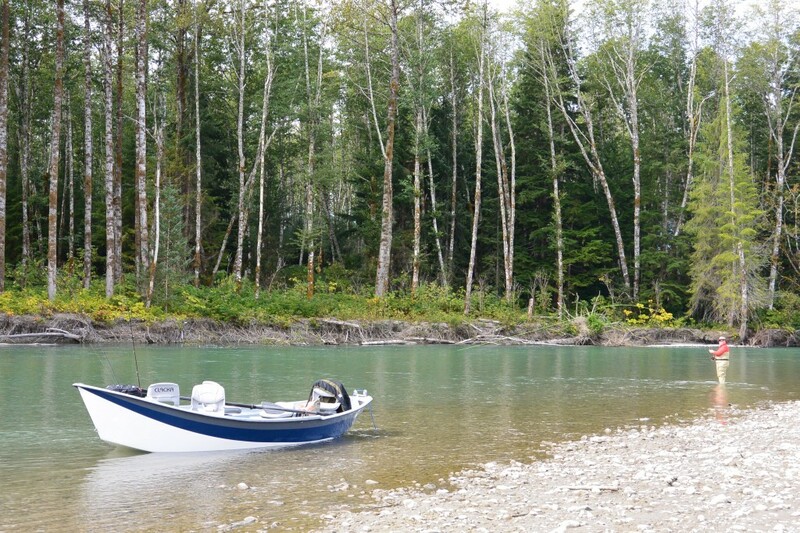 Skeena river Steelhead guides report 2016. 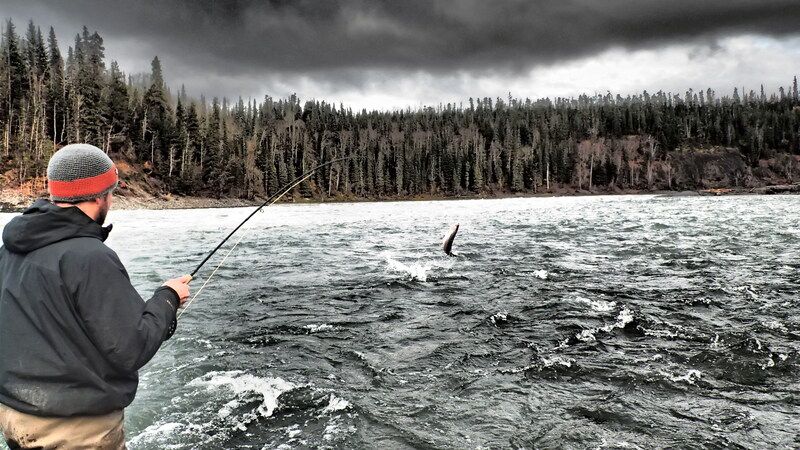 As we enter another year I reflect back on 2015 Skeena,Nass,Kitimat Salmon & Steelhead season we guided many anglers from around the globe, getting them hooked up to trophy Steelhead & Salmon of their own. I am proud to say this up coming year will mark a mile stone for Westcoast Fishing Adventures 20 YEARS and counting, as I enter this season I think of where it all began and the passion I still hold for the outdoors the rivers wild life and the creatures that inhabit this beautiful land we call home, at 42 years young I feel I still have a lot of good years ahead of me I am thankful everyday for my health that provides me the energy to give experiences to our faithful guests. Skeena river in search of Spring Steelhead. We will soon be attending Trade shows in the USA please come and see us at the Sacramento Show – Jan 21 to 24 I will also have the privilege to speak at the fly casting pond twice per day about The Skeena river and all it has given as well as tactics,reading water,casting,flies,favorite fly lines tips and tricks, We look forward to seeing you there and answering any questions you may have about Terrace BC. Most rivers are now giving way to Ice jams or flowing ice as we have a beautiful cold dry snowy winter with temps dropping to -12 with wind chills of – 20 the Salmon run was average except Coho/Silver salmon the returns were what I would consider very low, Steelhead numbers early on were looking good however as the season pushed on the catch rates were down. Not sure if it reflects the over all numbers? 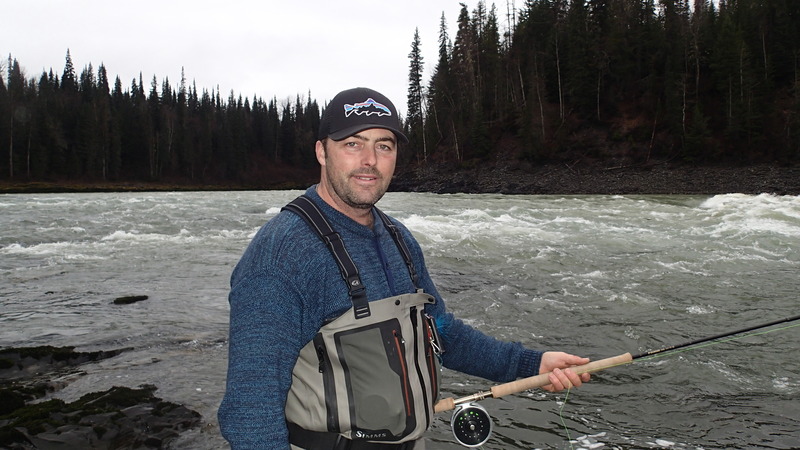 or the pressure on some area rivers, Bulkley,Copper,Babine,Kispiox,Skeean rivers to name a few seem to have a gold rush of spey casting anglers floating crafts,jet sleds,walk in waders you name it they came as we all love it! A little humor AS STEEL HEADER’S WE SHARE A LOVE FOR ONE ANOTHER AS LONG AS I AM FIRST! We also had heavy rain for the better part of September and October allowing the fish to travel un harassed. 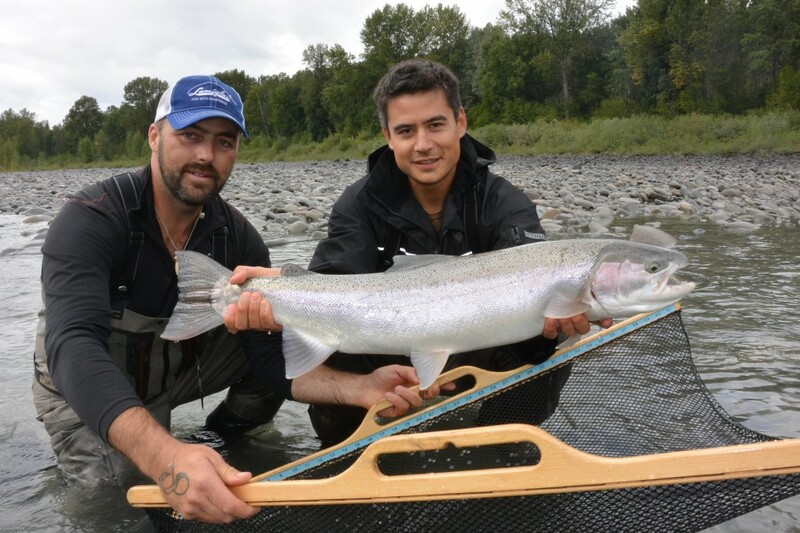 So what will 2016 bring to the angling Table as hundreds travel to Spey nation video movie gatherings,Trade Shows,Fly fishing shows to market the sought after Steelhead. They are now protected by Ice and water where they will shiver and spawn. Steelhead Camp the way it should be. 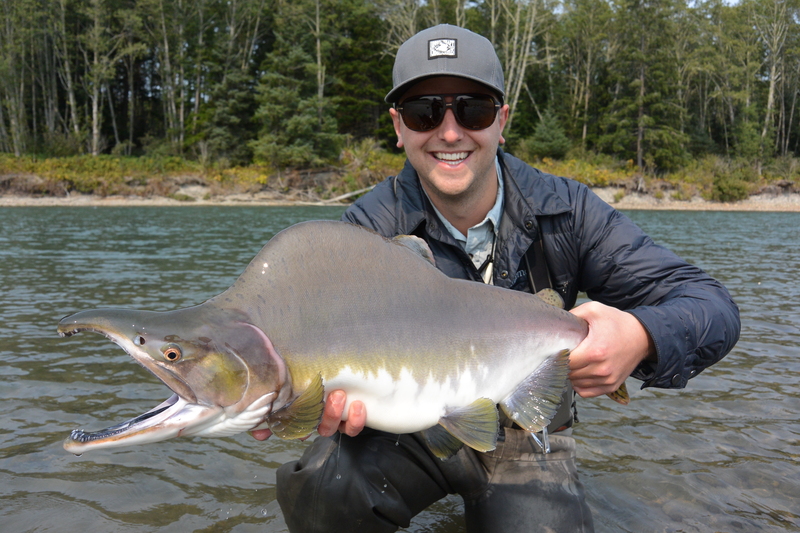 Skeena river Steelhead action September 11,2015 Guests of Westcoast Fishing Adventures hooking up swinging flies on the Skeena river, hooked up to some trophy steelhead while being guided by Gill McKean owner and 20 year guide out of Terrace BC Photos will tell the rest of the story. 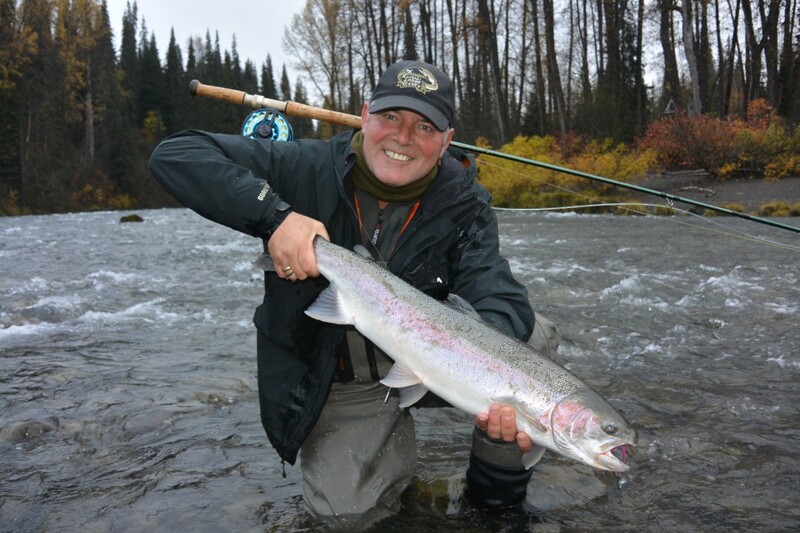 Steelhead are migrating through the lower to mid skeena in great numbers this season one only needs to hire a good guide or have experience with reading water and dealing with migrating fish to have some action on the water. 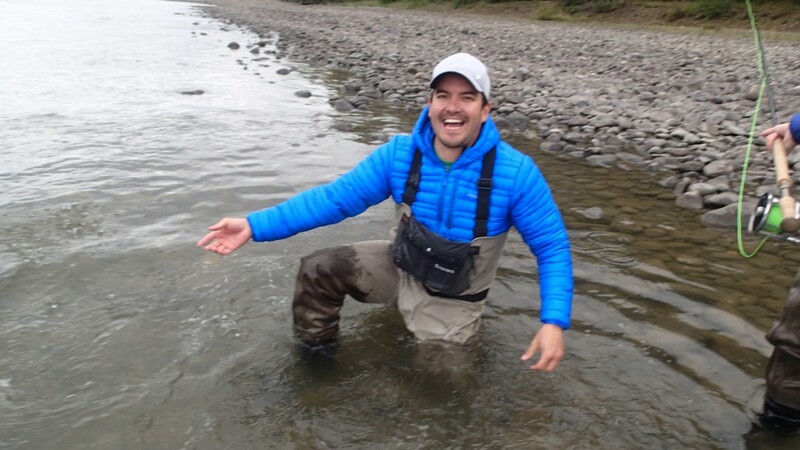 When fishing the skeena you never know what might grab your fly Dave found out ! 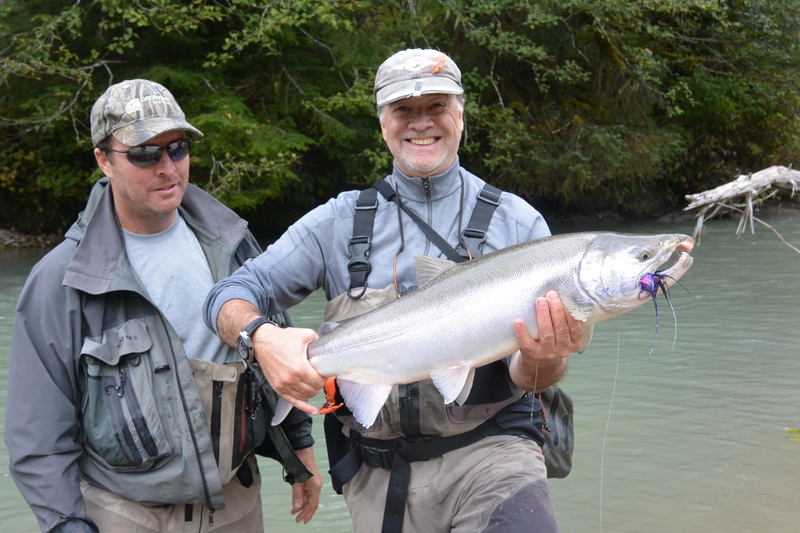 Dave releases a beautiful Skeena river steelhead. Salmon guide Gill McKean gets his guests hooked up ! 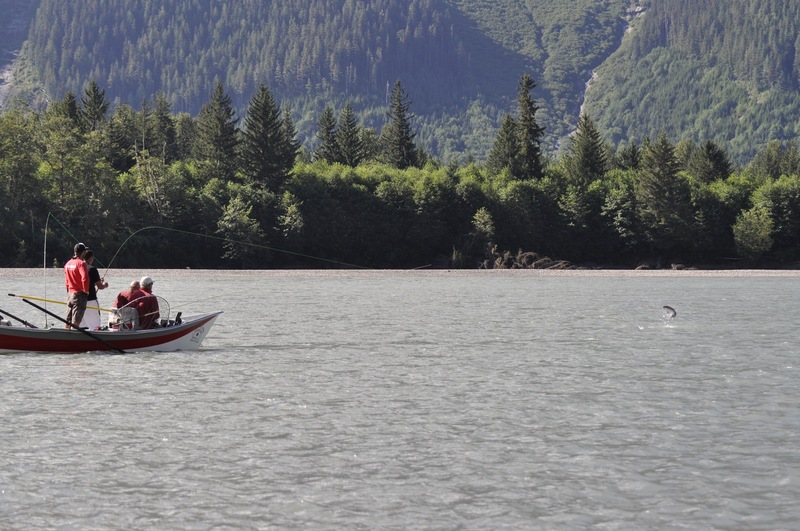 The copper river is blown at a this time coloring up the lower skeena as well however the weather looks to be improving the water will clean and the bite will be on. Tight lines to all. The love another steelhead fisherman shares with others is like this I love you as long as I get the run first. Quote Gill McKean. 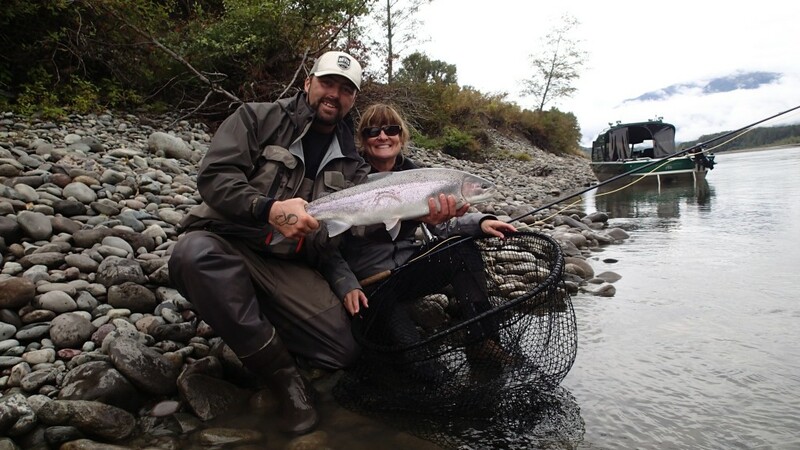 Gwen & Guide Gill McKean with another Skeena river steelhead. 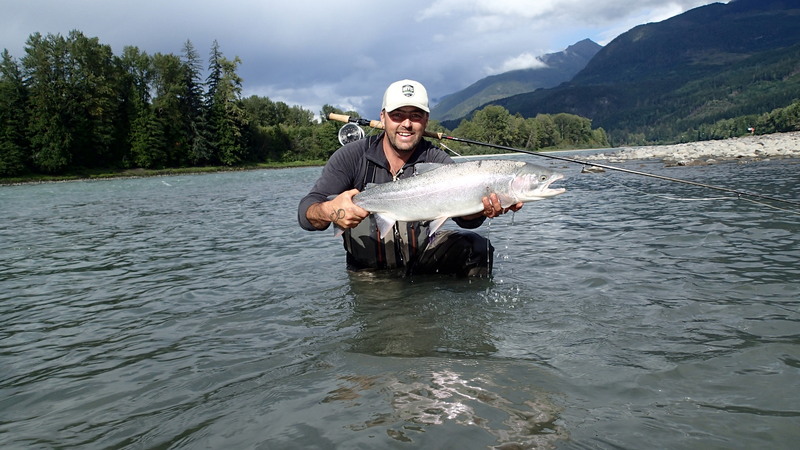 Jay from Vancouver Island holding another Skeena river Steelhead caught on the swing. Skeena river steelhead this page is dedicated to chasing wild steelhead on the Skeena river, Fly fishing for these creatures is addicting and can be consuming hence the steelhead “BUM” it has been 20 years this season I have been guiding these great rivers of north west BC. I have been able to see and do things that most would envy however the rewards are great but not with out hard work and many hours of dedication to this sport are you rewarded on a regular basis. 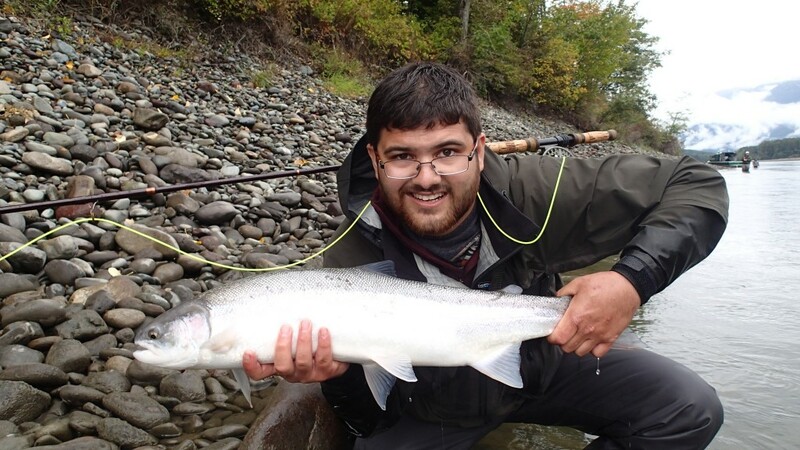 I have witnessed so many anglers some amazing casters that did not know how to fish and casters that could not cast 20 ft catch the largest steelhead Ive ever seen. So how does that describe the elusiveness of this creature we chase? ? 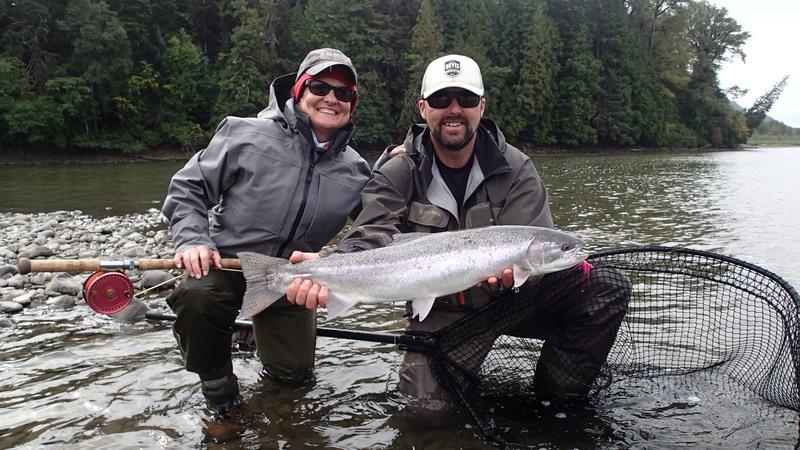 20 year veteran Angling Guide Gill McKean holding a Skeena summer run steelhead caught on the fly. 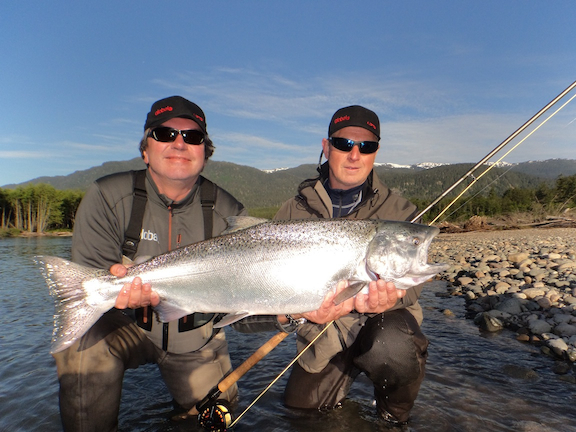 If you should happen to come across the page and would like to know more about Skeena river Steelhead please feel free to contact me on Face book or email @ info@westcoastfishing.ca or visit of web site www.westcoastfishing.ca and drop us a line ______________________we would be happy to hook you up ! 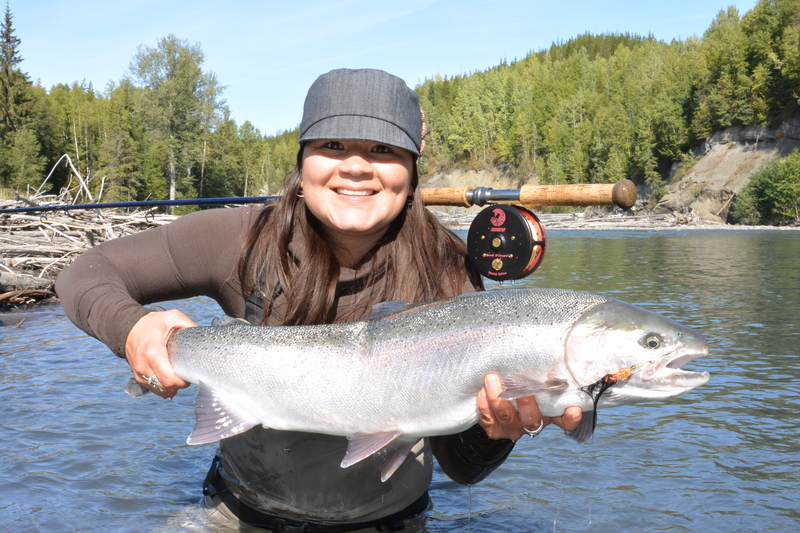 Skeena river guides for steelhead & salmon want to give you a quick recap of the preperation for spring steelhead season. 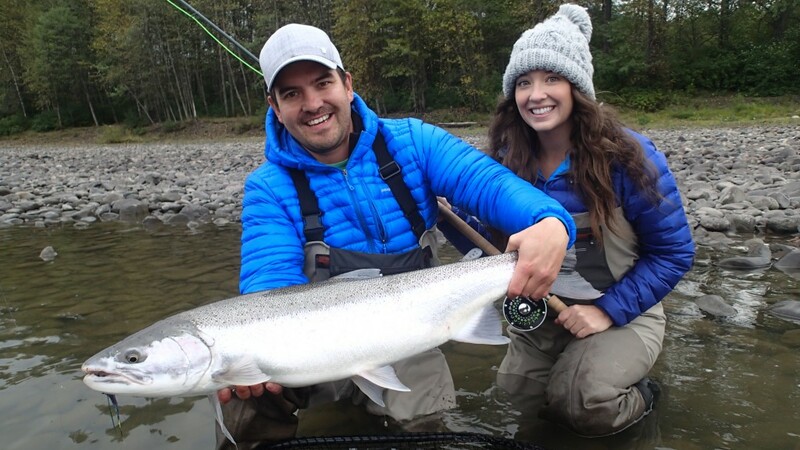 We will be starting our steelhead season guiding March 1 on the Kitimat river, Skeena river,Nass river,Zymacord river to name a few for trophy spring steelhead swinging flies over clear shallow tail outs for fresh sea run steelhead coming in on the tides. 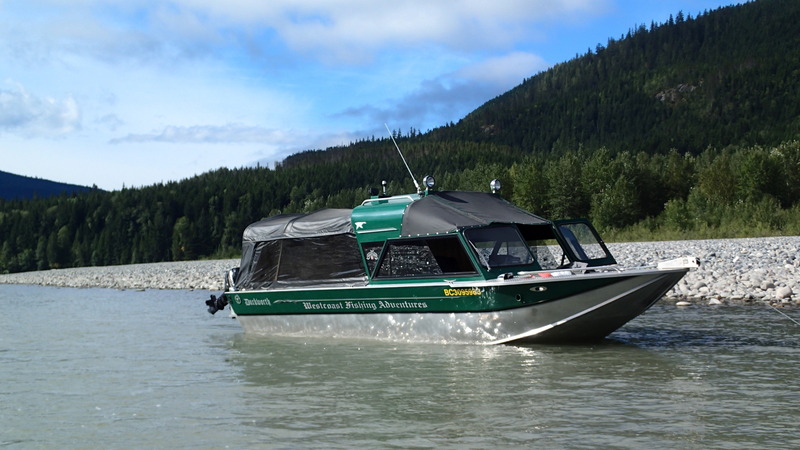 Our steelhead camp will be operating from March 20th to the second week in May on the Main stem Skeena this season we are shifting gears giving our return customers an opportunity to fish some new water while still having the ability to give them variety if needed. 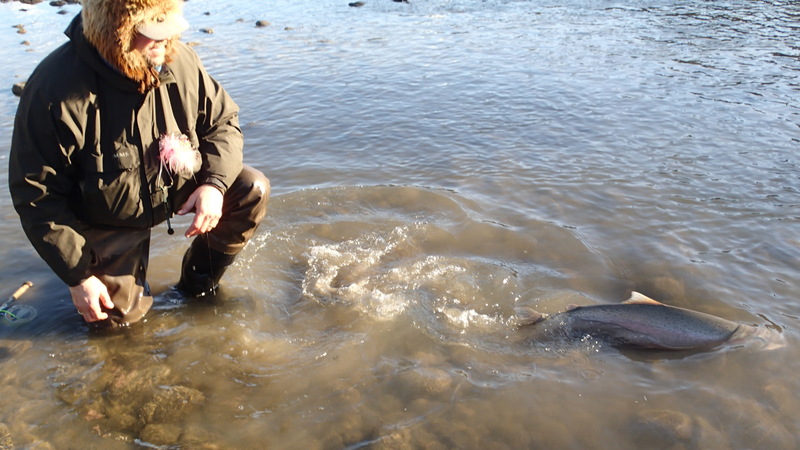 After all these are migratory fish that can be very unpredictable thus mobility and being ready to shift gears to another water shed can be key to hooking your very own trophy steelhead. Nass river Steelhead flying high. 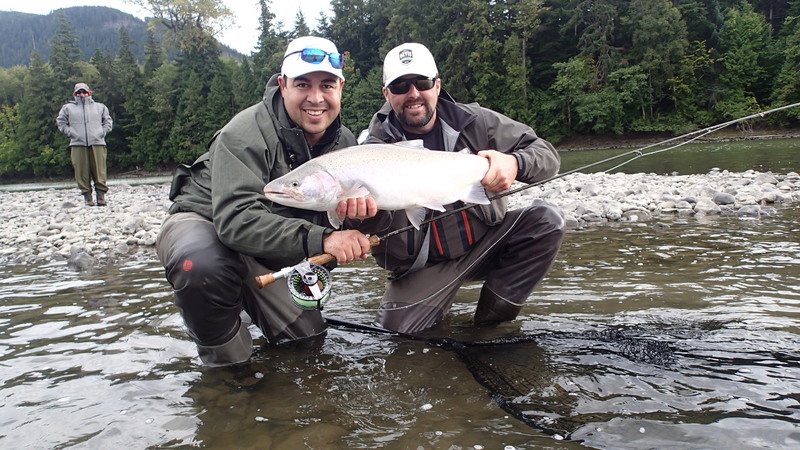 At Westcoast Fishing Adventures we pride our selves in guiding small groups of anglers giving them a quality experience from the time they land to the time they depart. We only take 4 anglers per week with a 2 per guide ratio this allows our anglers to not feel rushed through pools giving them every opportunity to feel the Tug of the mighty steelhead on the other end. 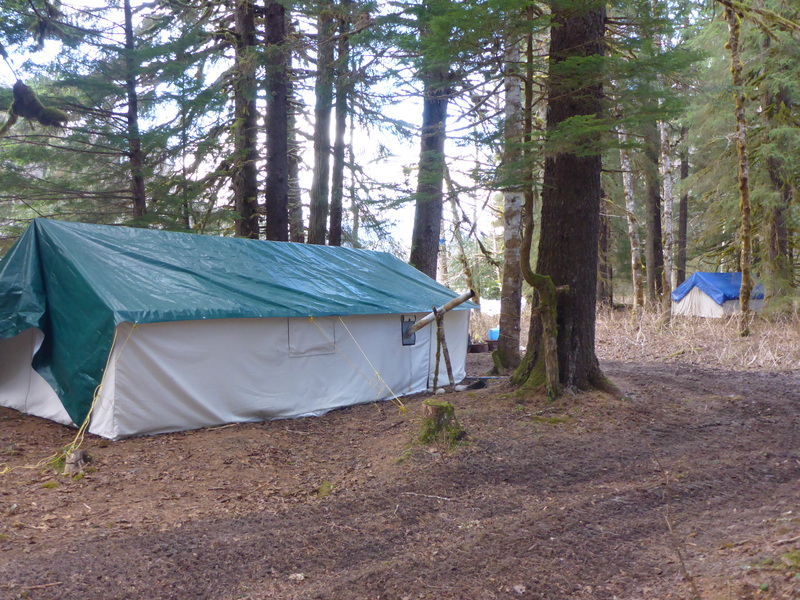 Our camp is very comfortable with 2 large wall tents and heavy duty cots guide outfitter sleeping bags are also provided and dry cleaned after every group. There is even a hot shower in camp with an endless supply of water. Dinners are prepared ahead of time to help with camp work our wonderful chef prepares home cooked meals that are put together by my self and Mr Pierce Clegg long time guide from Babine Nor lakes Ex Owner every evening along with a few cold adult beverages, there’s always a large fire to sit in the evening and share stories of the days events. 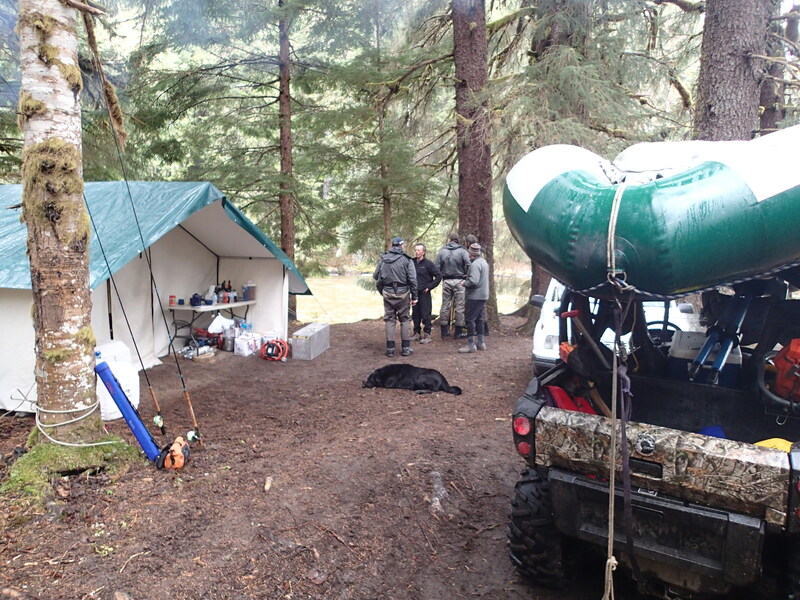 Clean well kept Steelhead camp. 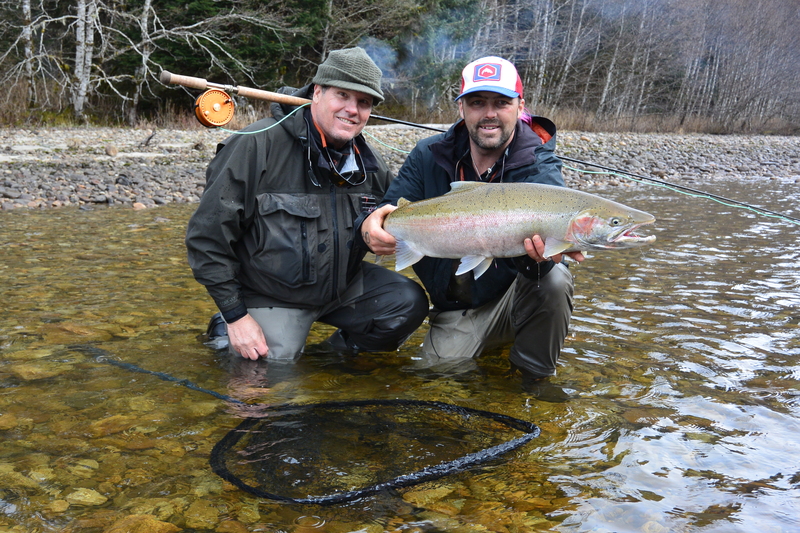 Remote wild steelhead with out the sound of Jet boats running only the sound of birds and flowing water & your reel screaming ! Welcome to a Westcoast Fishing Adventures. Pierce Clegg watching a steelhead swim off. Now a little note from our guest Craig Freas and what he has to say about our company after fishing Browns on the Rio Grande. steelhead except Gill McKean. Feel free to ask me additional questions. 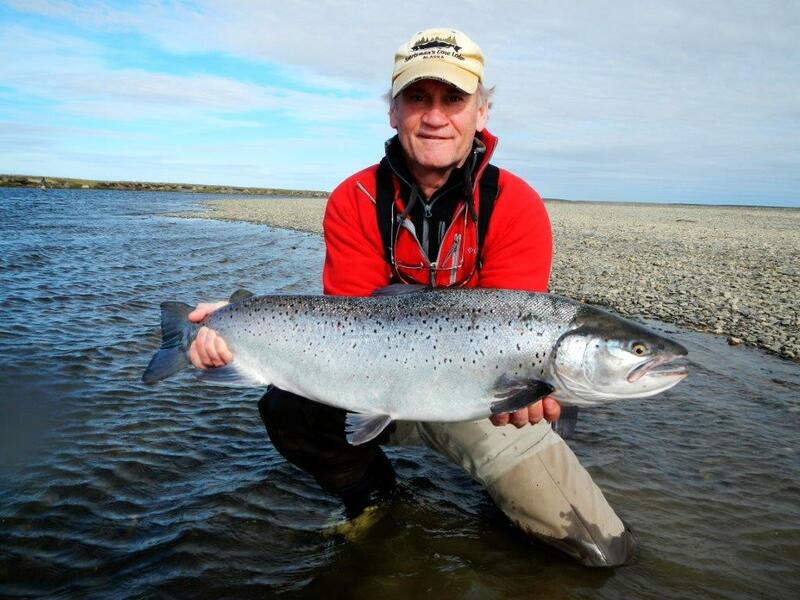 Long time guest with Rio Grande brown trout our anglers fish around the world. 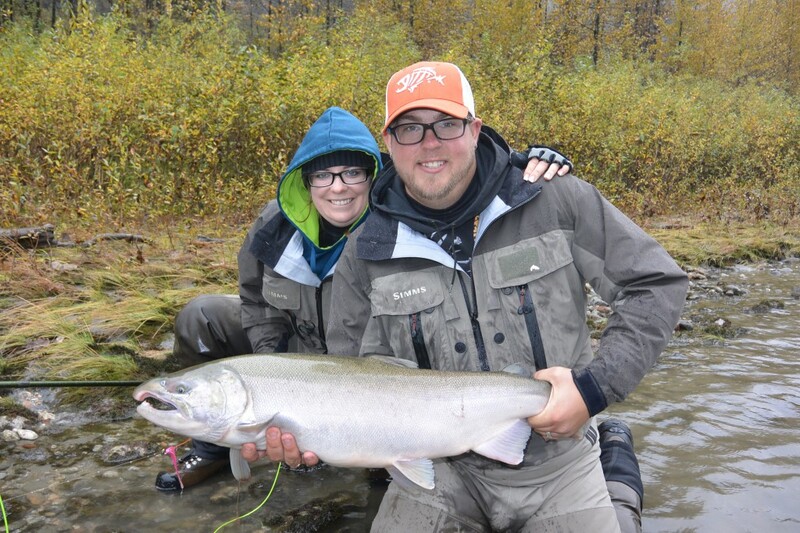 Skeena river fishing report for November 4 / 2014 . Fly fishing has been the method for the last 2 months, we are now taking a break and getting ready for winter to set in after a very successful fall Steelhead & Coho season. 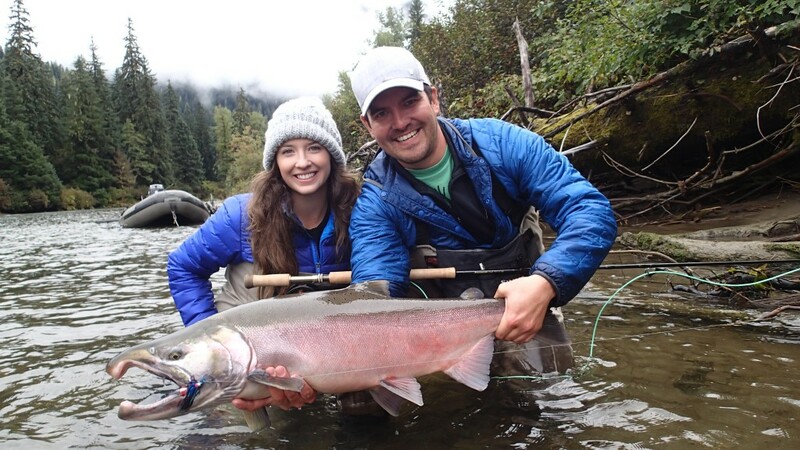 Not with out hard work and extensive knowledge of the Skeena,Nass,Kitimat regions, we traveled far and wide to get our guests hooked up to their own trophy fish. While most area lodges and guided anglers were packing their bags and posting face book messages about the “blown rivers”, we were hooking up! Not to blow our horn, but when being guided by Westcoast Fishing Adventures you are sure to find clean fishable water no matter what. The rest is up to you! One of our many company slogans goes like this – “We don’t sell ROD DAYS We sell Fishing Adventures!” So if you are looking for guides that know the water do there home work, look no further. 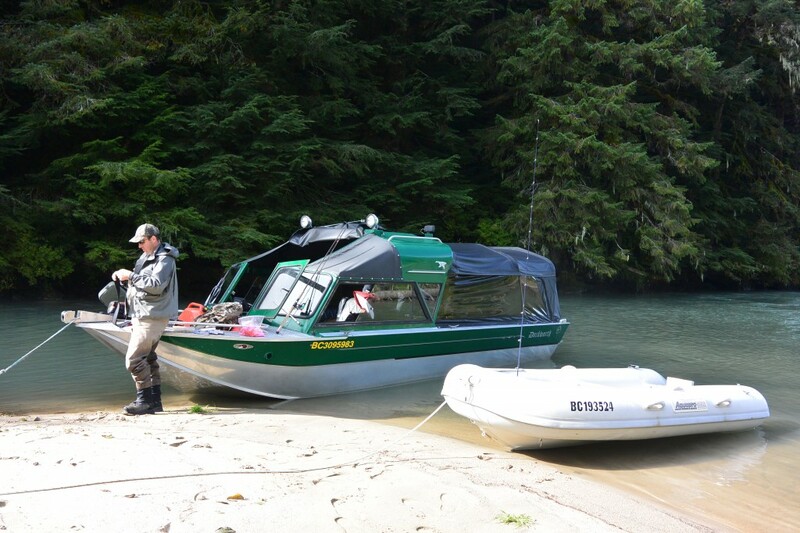 You have found the one and only Westcoast Fishing Adventures. 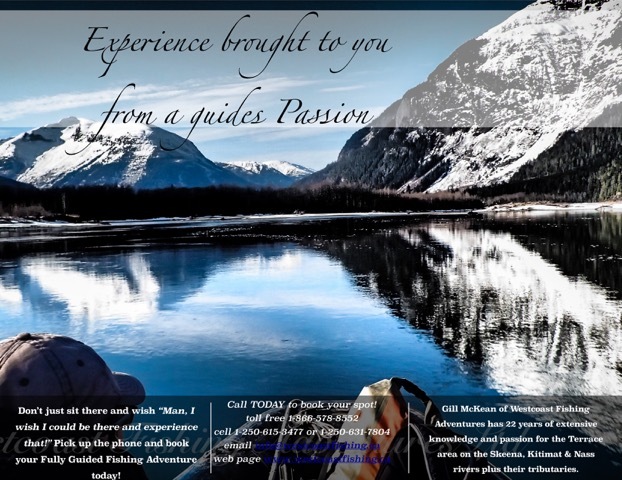 Westcoast Fishing Adventures So Far…..
We have had a very busy season, we have met some great new clients and enjoyed our long time guests, who have turned out to be like family. This summer we were faced with some low water conditions, which made for a bitter sweet problem: it was easier to catch fish. We are expected to have a “make up winter” this year, and building up our Snow Pack Levels for next year! Bring it on!